Welcome to the sword coast a region of Faeran that comprises shining paragons of civilization and culture, perilous locales fraught with dread and evil, and encompassing them all, a wilderness that offers every explorer vast opportunity and simultaneously promises great danger. While the sword coast adventurers guide is a valuable resource for Dungeon Masters, it was crafted with players and their characters foremost in mind. There is a plethora of new character options to intrigue and inspire every member of the adventuring party. 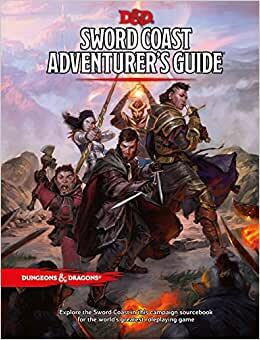 For use with the fifth edition players handbook, monster manual, and dungeon masters guide, the sword coast adventurers guide provides the setting, story, and character options needed to participate in a game anywhere along the sword coast of the forgotten realms. I'm going to attempt to explain why this book has gotten great reviews from some and terrible reviews from others. The answer is simple: some people are buying this book thinking it's something that it's not. I'll sum it up, then go into more detail. 1) Your campaign is not set in the realms or if your version of the realms largely ignores the canon in exchange for creative freedom. The Players' Handbook has enough info for both of these types of DMs, both on the Realms and on generic or non-realms settings. 2) You're doing it just for maps. The maps are each available to purchase for a couple of bucks from the artists' storefronts, in both printed and digital form. 3) You're looking for an exhaustive campaign setting. This is not a campaign setting. This book is for both DMs and Players, and includes 5e lore on major cities and settlements, deities, races, classes, etc, for a huge area. If it were that detailed, this book would need to be several volumes at minimum. 4) You're a player looking for custom classes. The class options are merely new paths for existing classes, albeit some of them might make the class feel wholly different like the swashbuckler rogue or bladesinger wizard. Still, they are class options. 1) You're running a 5e Forgotten Realms campaign, and want to stay true to the canon for the most part. This book is pretty good at showing where the realms stand in 5e without getting so detailed it puts a ton of constraints on your campaign. Still, as I mentioned before, if you like to go totally off canon, a huge portion of this book will be useless to you. 3) Players who are in a 5e Forgotten Realms campaign that want to fit their character into the lore so it doesn't feel generic and out of place. Now if you find yourself among the listed groups who might enjoy this book and aren't familiar with the Realms, there are several typos on the Neverwinter map. You can easily find a 4e map of Neverwinter on the internet if you want to see what the places are really called versus what appears to have been some bad autocorrect changes (Moonstone Mark, Clock Tower, Bluelake District [errors] vs Moonstone Mask, Cloak Tower, Blacklake District [correct]). If you're still interested in the book, the book supplies a great deal of knowledge about what is currently happening in the Realms since the Second Sundering, a time for which there is little information on wikis and the internet (that will change with time, but currently, this book is great if you want to know who is the Waterbaron of Yartar, or whether or not a particular deity is alive again). Wizards of the Coast is rolling back a lot of the unpopular lore changes from 4e, so the 5e Realms feel a lot like 3/3.5e Realms, albeit over a hundred years later. The sections on race supply mostly Realms-flavor for your character, which some people feel is useless. I, personally, enjoy this sort of thing, as not everything needs to be a game mechanic or enhancement. There are more in depth looks at sun and moon elves for instance, and a list of rarer elf types such as the winged Avariel. There are also two new races for this supplement, the duergar and the svirfneblin (which overrides the one in the Elemental Evil pdf). The classes don't all get new paths, but all have a lore treatment, and the ones that do have been criticized for not being completely new classes. I feel like the playtesting required for new classes would have delayed this book until next year sometime, and the lore is something a lot of DMs wanted now. The bladesinger wizard is the standout here, allowing you to make a melee wizard and there are several new cantrips to go along with it (or the new warlock option). The book also contains a lot of information on the Realms deities, having lists of all the deities including the non-human deities like Moradin, Brandobaris, and Correlon Larethian. Each deity has a short write-up and a picture of its symbol. These are not exhaustive histories of each deity, but rather the basics and how that deity fits in post-Sundering. The wiki is a good place to look up older info, or if you have older campaign setting books. There are also many pages detailing various towns and cities in the extended Sword Coast area (because the Sword Coast specifically refers to only a portion of what this book covers) as well as the major city-states along the Sword Coast (Luskan, Neverwinter, Waterdeep, and Baldur's Gate). The book also includes brief overviews of areas well beyond the borders of the Sword Coast, as most people of the realms would have heard at least basic info on these more distant lands. Overall, as a reader of the FR novels who DMs a group set in 5e Forgotten Realms, this book was exactly what I wanted. I've read a lot of the negative reviews and what they all have in common is the expectation for this book to be something that it's not and wasn't advertised as, and these people are mostly deducting points for their own lack of due diligence before buying. Admittedly, I too bought the book blindly, but since I hadn't played in 20 years since 2e and just having recently started a 5e campaign, I wasn't spoiled by the dozens of FR sourcebooks for 3e and 4e and expecting this one book to encompass all of that. If you have all of those books already, you can use this book to show you what has changed and how that information is relevant to the 5e setting. I give this 4 stars, because the book was rushed and there are a few minor errors (the only ones I found that might actually affect play is the name errors on the Neverwinter Map). 848 people found this helpful. This book has taken a lot of heat by reviewers and on the 5th edition boards. It's not as bad as all that. The problem is, this book is designed for a certain type of player...namely one who is not familiar much or at all with the Forgotten Realms. First, you will note the title of the book: ADVENTURER'S GUIDE. Not DM's GUIDE. Not CAMPAIGN SOURCEBOOK. It is not, nor is it meant to be, either of these thing. It is meant to provide a very broad overview of Faerun and the Sword Coast region in particular. If you are an experienced player or DM familiar with Faerun, almost nothing here will be of use to you for the first 50 pages of the book. Sorry, but you don't need a few paragraphs about each location in the Sword Coast or a few paragraphs about the deities of Faerun or a section on coinage of the Realms. But a new DM or player needs these things as an introduction, to allow him or her to design or play in a campaign set on the Sword Coast. That's what this book is, a broad framework for the unfamiliar. But, of course, WOTC needs to sell the book to everyone. So they added some crunch. Not a lot, but enough to make buying the book pretty necessary for experienced players. Does that mean experienced DMs and players will end up paying for 80 pages and using less than 30? Yep. Know that going in. So what's the crunchy bit? Mainly a few subraces, like deep gnomes and duergar, and more importantly, some class archetypes. Mind you, not every class gets new archetypes. Bards and druids, for example, do not. Some merely get expanded archetypes, like the barbarian which has new animals for its totems (barbarians also do get a new archetype, the Battlerager). But fighters get Purple Dragon Knight (a sort of warlord leader type), Rogues get Swashbucklers and a spy/infiltrator archetype. Clerics get the Arcana domain (for Mystra and Azuth worshippers [or Boccob if you are a grognard]). Sorcerers get a Storm related archetype. Monks get two new ones. You get the idea. In conclusion, SCAG is an invaluable resource if you are new to Faerun, In that case, definitely buy it as an introduction to the region. For those experienced in Faerun and with many previous sourcebooks to draw upon, you will have to decide if the crunch pages are worth the investment. I was hesitant to buy this release based on some of the reviews but finally decided to pull the trigger. Being a new DM, and also new to the 5E rules, I needed some background lore to fill my current and future campaigns. Not being familiar at all with Faerun or the Sword Coast when I began a few months ago, this book seemed like the only official publication that was going to give me that so I finally bought it. After having just read through it from cover-to-cover, and having very tempered expectations, I have to say that I was pleasantly surprised with it's content. This book provides a general background on all of the cities and towns up and down the Sword Coast and the West including the island nations off the coast. It also provides additional races, sub-races, and sub-classes along with new backgrounds none of which are in the Player's Handbook. There is also an extensive chapter on the gods worshipped by the peoples of these areas. I came away with a lot more background filler for my campaigns whether they be the WotC published variety or my own Homebrew. So, despite the low page count compared to the other official WotC publications, I feel like I got my money's worth for around $30. However, if you are already well familiar with Faerun's Sword Coast, you may only feel like you benefit from the new racial, class, and background information though it may still be useful to you as a quick reference on background lore.